Gate and blade valves have the advantage of full flow. Most ball valves are "nominal" and the ball inside is actually smaller than the rated size. So if you are using ball valves and flow is important, you should use the next size up and then use reducer bushings to take it back down. Or you can use gate/blade valves, which by their design are full flow. Browse our selection of PVC gate valves and flanged gate valve seal kits today. Note: Blade valves generally have a simple shaft that the gate is pulled up or pushed down into place. Gate valves also have a gate, but it usually is moved by a shaft with threads that move it up or down more slowly. 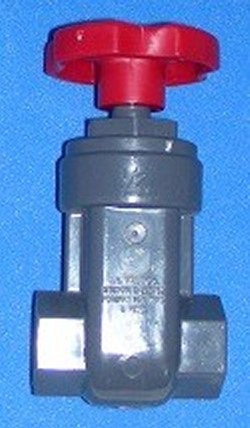 Blade valves are great when you want an "instant open" or "instant close." PVC Gate Valves are better if you are trying to regulate the flow somewhat. Ball valves are the best when cost is a factor. Ball valves are by far the least expensive valves available. True Union Ball Valves are one of the most expensive valves, however they can be rebuilt and serviced and are generally a better made valve. Explore our selection and discover the slip gate valves you need. See Our Valve Overview Page for links to all the different types of control valves we sell. Some MADE IN THE USA, some imported.